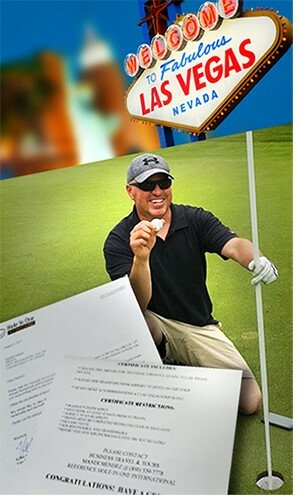 Toronto, Canada – Congratulations to hole in one insurance winner Nick Vanovereem of Burlington, Ontario who won a 7-night Las Vegas vacation, courtesy of the Ontario Regional Common Ground Alliance (ORCGA), and paid for by Hole In One International. Vanovereem, a field supervisor with Accuworx, won the $3,000 Vegas getaway, which includes both accommodations and airfare, after he aced the 176-yard, Hole 17 North, with a 5 wood, at the Station Creek Golf Club during the 12th Annual ORCGA Invitational Golf Tournament. It was Vanovereem’s first hole in one – a fact made even more impressive in that he played the round with rented clubs. Are you looking to add a bit more excitement to your next corporate golf event? Want to ensure that you make the most of your corporate sponsorship? Why not give every golfer the chance to win a trip to Las Vegas, Hawaii, The Masters or US Open? For more information on creating an enticing hole in one insurance tournament prize package that will help you sell more sponsorships, showcase your brand, or raise more money for your cause, visit our website or give us a call today at 800-827-2249.